What if I started a new weekly column? I could call it Lazy Sunday Cooking, or, better yet, Recipes for Dummies. What do you think? Yes-yes-yes-yes-yeeeeesssss? Well then, let's begin! P.S: Before I start ranting about the extremely difficult execution of this recipe, I must confess that I am a sucker for the use of fruit and/or nuts in savory dishes. I'm just telling you, en passant, in case one day you had this great idea of inviting me over for dinner. Brussel sprouts about 2 lb. Wash Brussel sprouts, cut the hard ends and discard the outer leaves. Cut the bigger ones in half, and leave the smaller ones whole, so that you'll end up with pieces of pretty much the same size. Drizzle with 1-2 tablespoon olive oil, salt, and pepper (if you'd like, you can also add a couple of tablespoons of pomegranate syrup, and if you're not that lucky to have a Middle eastern specialty store around the block, well, you can always make it yourself; don't worry, it'll still be a Recipe for Dummies). Place Brussel sprouts on a baking pan lined with parchment paper, add garlic cloves, peeled and cut in half, and the onion, sliced thinly. Bake at 400 for about 30-40 minutes, until Brussel sprouts are roasted on all sides. Meanwhile, roast the hazelnuts in the oven for few minutes, rub them with your hand to eliminate the inner skin as much as possible, and chop coarsely. 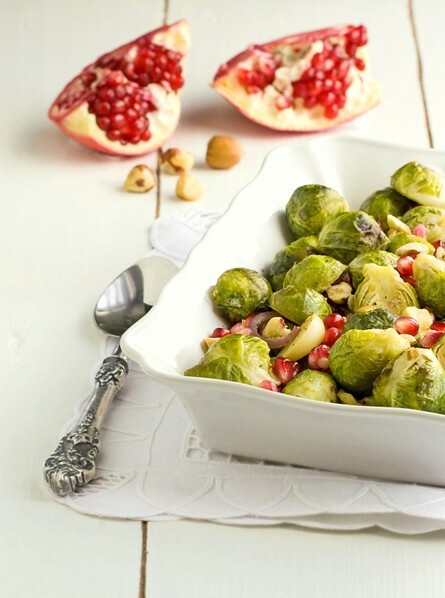 Mix Brussel sprouts with pomegranate seeds and hazelnuts, and serve. I like lazy sunday cooking as a title!